On my way to work this morning, there was news that Fannie Mae (FNM) and Freddie Mac (FRE), two congressionally chartered mortgage agencies, were on the verge of being bailed out by the government. That was not a piece of good news, given how hard the stock markets have been hit by subprime mortgage related woes in the financial market. At the time when I heard the news, both FNM and FRE were down some 50% from previous closes in pre-market trading. 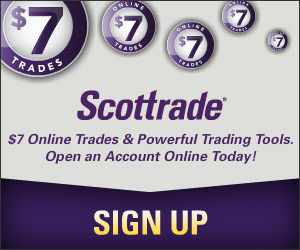 Scottrade to Offer Free Dividend Reinvestment? It’s possibly due to heavy volume and the fact that you didn’t purchase a round lot. (It requires more effort to find a seller of 16 shares than one of 100). Kind of strange. I wish scottrade had stopped me from buying some terrible preferred stocks through them. Instead, they have them rated AA. Guess what .. they have lost 40% of their value. They have 35 years to run. They didn’t tell me that anywhere on their web site links about preferred stocks. Son’t lose your money. Go to a real broker. So, you might be losing money right now. Was that an example to show us how stock gambling is bad? “How bad things could be?”? That’s funny. Well, I am not looking at the stock price the day after I purchase it, or three days (which is today), a week I bought the stock. I probably didn’t buy the stock at the best time as I could, but if I look at the share price of FRE or FNM one month, two months, one year, or two years from now, I am confident that I made a good buy. 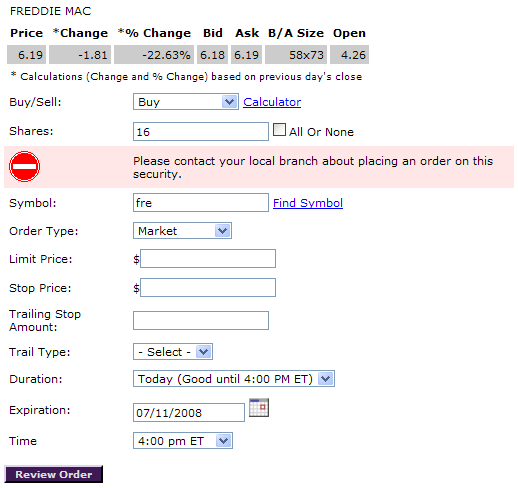 I am going to invest in freddie mac(fre), at 46 cents a share, who could walk away from this. freddie Mac and Fannie Mae both have political ties and they will never disappear. Bottom line, invest now, wait about 5 months and i could guarantee that the stock will rise to a 4.00 to 5.00 a share. i am no Warren buffet, but if you play your cards right and monitor these stocks, you will benefit yourself and your portfolio!!!! I bet you feel stupid right now, don’t you? You can grab the shares at 75 cents now if you really like the stock. What’s stopping you? I have been buying shares of FRE for almost 9 months now and have 425 shares @ .81. it has taken that long for me to finally get in the green but sottrades second opinion weekly has upgraded it to a buy and after a small pull back i believe this stock will continue to go higher. question: i bought stock of FNM back in 2007, and it apparently went belly up. so i was like, “whatevers, only a couple hunder shares” and never checked my portfolio. i just checked after 2 years, thinking that i wouldn’t have FNM in my portfolio, but it’s still there at 1.15, does that mean i still have the shares? i thought if they go bankrupt and the fed bought them that i’d have no way of getting any money back.